At the bottom right it the pink and dark purple cloud looks likes a fox running around a field chasing a bunny. 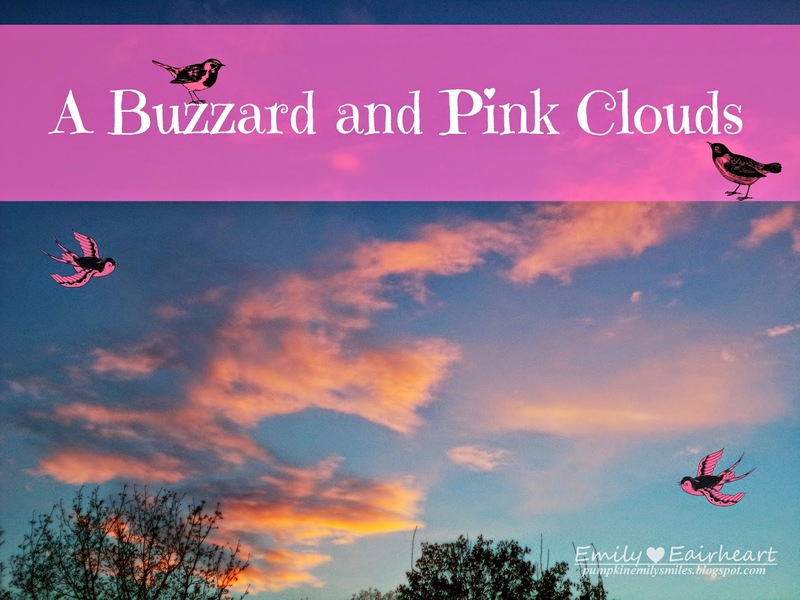 I love the pink, orange, and yellow colors that are in the clouds next to the trees. One of the clouds to me looks like a genie. I found another Cheshire cat moon. I like how the clouds are surrounding the Cheshire cat moon. Maybe the Cheshire cat is going to disappear in pink clouds of smoke. The leaves that are on the tree branches remind me of people dancing in the sky. The one cloud closer to the bottom looks like a lobster. Before I was going to go inside, I was trying to take a picture of a Lily of the Valley. I heard weird noises behind me. I look back and I see a huge shadow behind me. I thought it was coming towards me but thankfully it didn't. The shadow flew into a different tree. It turned out to be a Buzzard. I think I almost had a heart attack. Before I went inside I tried to get a picture of the Buzzard. I wished I could have zoomed in farther to get a clearer shot but my camera doesn't zoom in that far.